The Master of Orthopaedic Surgery (MCh Orth) and Orthopaedic Science candidates attended a workshop on Shoulder Surgical Exposure organised and jointly run by Mr Aprit Jariwala (pictured right with glasses) on 2nd November 2017. The workshop was held at the Centre for Anatomy & Human Identification (CAHID) at the main University Campus where the participants undertook the various surgical approaches themselves. Each participant had a Thiel cadaver to themselves and for every participant there was a faculty member leading them through the various exercises. Thiel embalmed cadavers were used, which is unique to the MCh (Orth) Dundee course, and affords more realistic, moveable and flexible cadavers to simulate real-life surgery. All students received a certificate of participation. 3. The tricky ‘’posterior approach to the shoulder joint. For the first-time students had the unique opportunity of using implants in lifelike scenarios. Mr Dean Gartland from Depuy Mitek, who works closely with Mr Jariwala, kindly arranged rotator cuff anchors for the students to undertake open cuff repair and practice knot tying. “On behalf of the students, and myself as Course Director, I would like to say a huge thank-you to Mr Jariwala (himself a MCh Orth, Dundee, Graduate from 2003) and the attending Faculty on the outstanding organisation of this annual workshop. 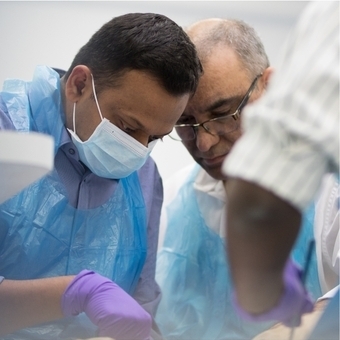 It is a fantastic opportunity for our candidates to benefit from the sharing of their vast orthopaedic surgery skills. We are always obliged to Professor Dame Sue Black and all the staff at CAHID for their continued support in using Thiel embalmed cadavers which gives our students an opportunity to experience this unique approach to surgical training techniques. I would also like to state my gratitude to all those who generously bequeath their bodies to medical science for anatomical examination, research, and education and training”. “Dear Mr Jariwala, I cannot thank you and the team enough for arranging the shoulder and arm dissection session yesterday. I had been waiting for this moment for a very long time. The last time I was around cadavers was in 2004. Dissecting on a Thiel embalmed cadaver all to myself and with a Consultant watching me, correcting me, demonstrating and guiding me at every step … I couldn't have asked for more! I am actually amazed and heartened at the way you are so interested in training us. This MCh (Orth) programme has been helping me improve on a daily basis but with what we experienced yesterday in the dissection hall, I am falling short of words to thank you Sir”.